"Don't Let Me Down" is a song by American production duo The Chainsmokers. The song features the vocals of American singer Daya. The song was written by Andrew Taggart, Emily Warren and Scott Harris. It was released on 2016, through Disruptor Records and Columbia Records. 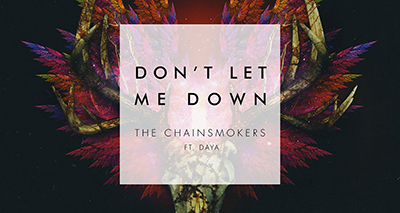 The song "Don't Let Me Down" became both The Chainsmokers' and Daya's first top five single on the US Billboard Hot 100, peaking at number three. It also became The Chainsmokers' second consecutive top 10 entry after "Roses", which peaked at number six. It reached the top 10 in several countries, including Australia, Austria, Canada, Germany, New Zealand, Sweden, and the United Kingdom. >>> Visit website https://123ringtones.info/ to download free ringtones for you!